No longer able to indefinitely stand by as spectators before the tragedy exterminating Congolese citizens "Nande" of the territory of Beni, Mai-mai patriots finally decided to return to their noble plateau of popular self-defense mission. It is an intervention that transcends categorization in terms of such a group from Mai-Mai or another. This is an alliance of all patriotic loving attention to the defense of defenseless civilians delivered to the extermination for two whole years in Beni territory. Caming from all over the territory of Lubero, but especially its southern part, a multitude of patriots from Mai-Mai was found Friday in Butembo to conduct an aggressive raid on cutthroats in Beni. The white garment adopted by these fighters is just a sign that they are restoring peace whose dimension finally escapes the Congolese national and local authorities along with their security and defense officers who are deployed by thousands (about 20,000 soldiers) in Beni, but without any positive results. Also, at every step of their advancement towards Beni, these Mai-Mai wanted to be truly "patriotic" by showing their willingness to submit in collaboration with public institutions: at their offset in Lubero, they have requested official permission for traveling from the Administrator of the territory. At Butembo, they wanted to confirm this good intention in fulfilling the same formalities with the Mayor of this city before beginning the descent into Beni. 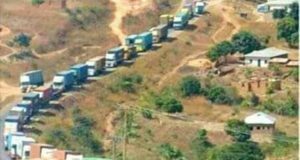 However, the gossips of the national army deployed for concerns other than the return of peace in Benilubero rather have unsuccessfully tried to neutralize them in Butembo. 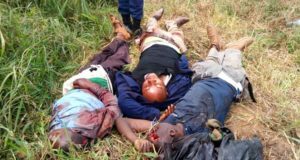 In the balance sheet, a FARDC soldier killed, others have been wounded, said military and weapons seized (including a rocket launcher) by the Mai-Mai. As for Mai-Mai, no casualties. On the civilian side, the FARDC launched a rocket shells at a school, causing several deaths and injuries including students and teachers. Yet these Mai-Mai are armed with stones, slingshots, sticks, spears, bows, arrows and machetes. This obstacle did not prevent Mai-Mai to pursue their goal toward Beni where countless multitudes of people awaited them as hero. So it is with the king and princes honor the patriots from Mai-Mai were received in Beni and Butembo on Saturday, October 15, 2016. This enthusiasm was further strengthened when these patriots presented themselves as "Bakombozi" Swahili term meaning "the liberators." In Beni, about two thousand (2,000) young people soon joined them to immediately initiate the search of the bush and forests that serve as the murderers hiding areas in the outskirts of the city. Among the first results of this search, it records the successive discovery of three camps of cutthroats they had each time to abandon at the approach of the brave patriots accompanied by local youth. With this determination, the Mai-Mai have resolved to erect their camp in the bush, in the forest of death, to permanently stop other cutthroats overflow into the city. The population, meanwhile, engaged a maximum collaboration with these patriots. Spontaneous contributions were immediately initiated to provide support to the "liberators" of food and clothing. – Instead, Sunday, October 16, 2016, officers from 1 Sokola, gathered around Fall Sikabwe to plan how to decimate the Mai- Mai, who decided to establish a safety belt, from the same forest, to protect the city against any attempt at a new incursion of cutthroats. This phenomenon from Mai-Mai, as it was observed this last weekend in Lubero, Butembo and Beni, indicates a scandalous vacuum of state authority. Great yet is the fear of government manipulators, even those who carry out massacres of Beni, divert these countrymen of their initial objectives to neutralize cutthroats, finally restoring peace in the Beni area and allow the displaced returning to work their land. Précédent : CÉLÉBRATION DES QUATRE ANS DE L’ENLEVEMENT DES TROIS PRETRES ASSOMPTIONNISTES DE MBAU. Suivant : CELEBRATION OF FOUR YEARS OF THE KIDNAPING OF THREE ASSUMPTIONIST PRIESTS OF MBAU.